Samarkand is one of the ancient cities of the world with its 2750 year history; it is the contemporary of Rome, Athens and Babylon. The city is located on the left bank of the middle course of the Zarafshan river, in the center of the Republic of Uzbekistan. In ancient times it was the capital of the powerful state Sogd. At the entrance to the city the forking of Afrasi-ab remained, where old Marakand, with the name of which Central Asian campaigns of Alexander of Macedon are associated. Samarkand for a long time has been the most catching object to the eyes of politicians, businessmen and travelers. It reached the prosperity and grandeur in the time of Timur the great. The city had an advantageous geographical situation; it was an important crossroad on the Great Silk Road. This epoch left the most significant marks in the historical and architectural appearance of the city. Magnificent samples of medieval architecture affecting the perfection of forms and riot of colour, were kept in Samarkand. 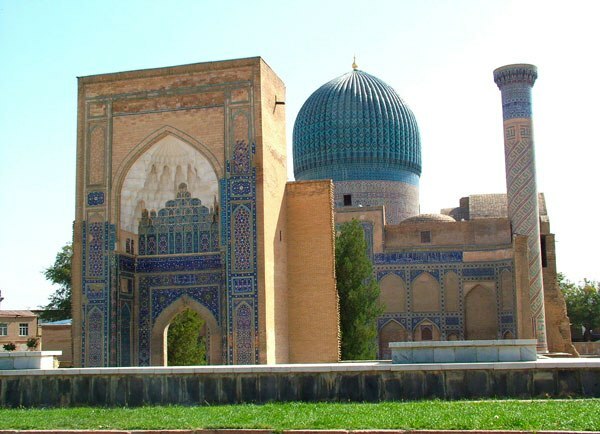 Samarkand ensemble of mausoleums Shakhi – Zinda on the slope of Afrosiab is the place of interest of whole Central Asian architecture. 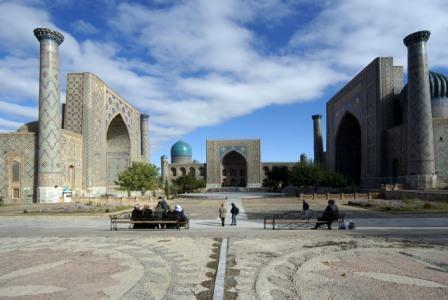 Its formation began in the XII century, the main building was in XIV- XV centuries in Timur’s time. Burial vaults of women of Timur’s clan prevail in the ensemble. All buildings differ by the rich architectural décor: carving composing mosaic, carving casting terra cotta, relief and painted majolica. Registan is the combination of grateful majolica and sky-blue mosaic. Gur-Emir mausoleum (XV century). Timur with his sons and grandsons was buried here. There is a one-colour marble marker of Mirsaid Barak on the left above the tomb. Mirsaid Barak was the most respectable mentor of Timur. The tombs of Mukhammad Sultan, Timur’s grandson is in front of the ossuary. The tombs of Shakhrukh and Mirshakh are behind the gravestones of Timur’s marker, and UmarSheikh’s gravestone is behind them (Timur’s sons). The burial vault of Gur Amir became the prototype of Taj Mahal in Agra. As “a scientist on the throne ”, patron of science and education, Timur’s grandson Mirzo Ulugbek, went down in history. He gathered outstanding scientists. In 1420 during Ulugbek government, the observatory, which had no equal, was build. Star tables “Zidji-Gurgani” formed here have kept their scientific significance till our days. Only the foundation and a part of the astronomical instrument – sextant have remained of the observatory. The greatest prosperity of the construction of the necropolis was in the last quarter of the XIV century, the time, when the construction of mausoleums of Timur's family members, military leaders and nobles began. Several buildings of the ensemble "Shakhi -Zinda" belong to the first half of the XV century, time of Ulugbek. These include discreetly decorated portal (1434-1435) at the foot of the hill Afrosiab and standing on the hillside above, the mausoleum with two turquoise domes raised high over the tomb of the astronomer Kazi-zade-Rumi, a teacher of Ulugbek, as expected. Open space in front of the mausoleum "Kazi-zade-Rumi" is replaced by a narrow passage, built up on both sides by the mausoleums of Timur's time: "Emir-zade", "Tuglu-Tekin," "Shadi-Mulk-aka" ("Turkan-aka") and "Shirin Bika-aka". The main facades of these small buildings having only one hall are composed in the form of a portal focusing on a rich colorful decor. Only the octagonal mausoleum with open apertures on both sides, decorated with mosaics of glazed bricks, probably, originally (the first half of the XV century) covered with a dome on a high cylindrical drum differs from them. In 1997, on the decision of UNESCO the 1225-year anniversary of the outstanding scientist and scholar of the East of Imam al-Bukhari was widely celebrated. By the anniversary date in the village Khortang near Samarkand, where the great mukhaddis was buried, the memorial was restored. Ancient Samarkand generously gives its guests the unique historical and architectural monuments, the inimitable craftsmanship of artisans, folk customs and holidays, the secrets of oriental cuisine. Modern Samarkand is a well-planned city. There are many parks and gardens. The city became one of the most important cultural centers of Uzbekistan, it has the university, other educational establishments, scientific institutions, opera and drama theaters, and numerous museums.